If you are new to exercise or suffer from repetitive injuries then these 5 bodyweight exercises for beginners are for you. Beginning your exercise journey by mastering the most important and influential bodyweight exercises will be transformational. Below I have reduced down the hundreds of bodyweight exercises to the essential 5 that will be the most influential on your: movement, strength, stability, mobility, balance and core. The ability to move and control your bodyweight is very important for daily life. Without realising it you are performing variations of bodyweight exercises every day. You squat when sitting down, lunge when climbing the stairs and deadlift when picking things up off the floor. Although these essential movements are taking place all day they are often performed badly and with compromises due to a lack of strength and mobility. Simply learning to master a handful of bodyweight exercises will help you to move better, look stronger and feel more energised. Everyone should learn to master their own bodyweight and improve their movement skills before progressing on to loaded exercises. Yes. For most people your own bodyweight is enough to stimulate muscle growth and increase your metabolic rate which is excellent for fat loss. Simply by combining bodyweight exercises you can create very effective workouts that require no equipment. Yes. If you use the correct bodyweight exercises and perform them through their full range you can create workouts that overload muscles and stimulate growth. Can you get toned from bodyweight exercises? Absolutely. Just working through a handful of bodyweight exercises you can quickly activate and tone every muscle in your body. Can you get strong with bodyweight exercises? Sure can. Gymnasts are some of the strongest athletes around and they build incredible strength by just using their own bodyweight as resistance. Will bodyweight exercises burn fat? Definitely. The secret to burning fat is to raise your metabolism so you burn fat even when you are not exercising. Bodyweight exercises will add muscle tone to your body and therefore increase your metabolism for 24/7 fat burning. There are hundreds of bodyweight exercises but these 5 are the ones that will give you the greatest full body return for your efforts. Master these 5 bodyweight exercises and you will suffer from less injuries, look better and move better too. The bodyweight single leg deadlift will improve your joint stability, legs, buttocks, hips, core and back muscles. You will develop better coordination, balance, alignment and strength from this exercise providing a strong foundation for hundreds of other hip hinging exercises. First practice this exercise with a wall in front of you to reach towards. Your objective is to stretch and lengthen your body from finger tips to back heel all while balancing on one leg. Draw your belly button in as your reach forwards and push the rear leg backwards. Try to keep your weight on your mid-foot and heel rather than your toes. Your hips will try to open up and rotate outwards, do not allow this to happen focus on pointing your toes towards the floor. Move slowly and with control pausing at full stretch for a few seconds. What’s next once you have mastered this exercise? Kettlebell single leg deadlift, Kettlebell single arm deadlift, Kettlebell swing, Kettlebell clean. The shoulder taps exercise strengthens the shoulder stabilisers, chest and core muscles while at the same time teaching correct full body alignment. Those new to this exercise should first practice holding the top push up position. There should be a straight line from heels to shoulders, the hips should not be allowed to drop towards the floor putting unwanted pressure on the lower back. The core muscles should be braced and the buttock muscles squeezed tight. 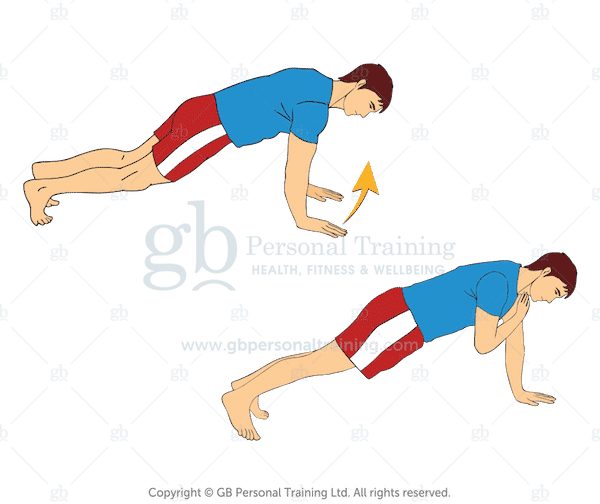 Once you can hold the top push up position for 30 seconds without dropping the hips then you can progress to tapping opposite shoulders with the hand. Shoulder taps should be performed slowly and with control focusing on keeping the hips as stationary as possible. If you lose full body alignment and your hips fall to the floor then it is time to stop. The yoga squat is the ultimate full body strengthening and mobilising exercise. Squats are a fundamental part of all our daily lives from sitting down to getting into your car to using the toilet. Squatting opens up the joints of the back and pumps vital nutrients into the spine helping repair and mobilise the back. The yoga squat strengthens the legs, hips, buttocks, core, shoulders and back muscles. Those new to the squat can practice just dropping down into the bottom position and then pushing back up again by holding a post or doorframe. Your heels should always remain on the floor, your chest up and knees not allowed to cave inwards. 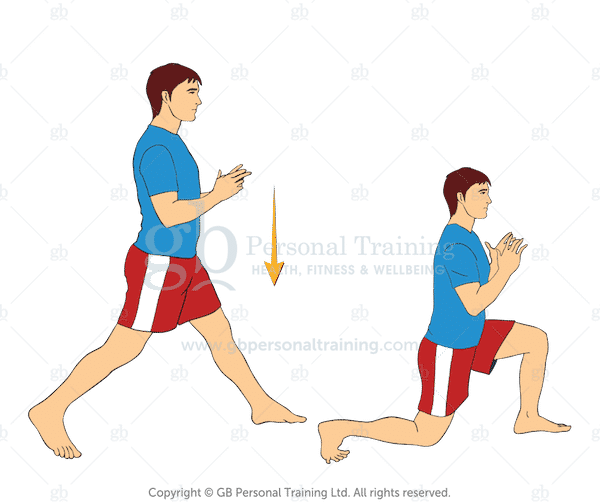 Once you can perform the basic squat, up and down, then you can add the other movements of the yoga squat which will strengthen the hamstrings and further mobilise the joints. The bird dog exercise will strengthen the back of the body along with the core, shoulders and buttock muscles. From the all fours position with hands under shoulders and knees under hips extend the opposite arm and leg. The cross body extension of this exercise will improve your posture while at the same time strengthening the connection between shoulder and hip. The leg extension will develop strong buttocks and protect the lower back whereas the arm extension conditions the shoulder girdle. Be careful not to raise the rear leg too high as this will arch the lower back and cause problems. As with the single leg deadlift always think about getting long and stretching out the body as much as possible. The arm that is on the floor should be kept straight and the shoulder kept back in its socket. Move slowly and with control pausing for a few seconds at full extension. The static bodyweight lunge is a leg strengthening exercise that is also good for improving hip mobility and core control. The lunge movement pattern is used frequently in daily life when climbing stairs and so should be conditioned. For this exercise the feet remain in same position as you drop down until the back knee kisses the floor before standing back up again. The front leg should form a perfect right angle and your weight should be evenly distributed between front and back legs. Keep your chest up and look forwards throughout the entire exercise. If you start to wobble around a bit then tighten up and brace your core muscles to maintain a little more stability. If you still find balance an issue then ensure a wall or the back of a chair is by the side of you for balance assistance. I recommend that you practice all the above exercises individually before adding them into a workout. Perform each exercise with great technique, one exercise after the next. Try to limit rest periods in between each exercise to elevate your heart rate. Work up to 3 complete circuits with 60 seconds of rest in between each one. Practice the above circuit 3 – 4 times per week. Increase the amount of reps for each exercise as you get stronger to challenge yourself. What About Bodyweight Exercises for the Back? You may be wondering why I haven’t included bodyweight exercises for the back like Pull Ups and Rows. The yoga squat having the hands overhead challenges the upper back as does the bird dog exercise. All 5 of the above bodyweight exercises will strengthen the buttocks and lower back. I do recognise the importance of the pull up and row exercises but for beginners these are usually too demanding and often performed badly, plus they require equipment. You should still master the above exercises to strengthen the shoulder and back stabilisers before attempting any rowing or pull up based exercises. There are 5 bodyweight exercises that every beginner should master before progressing on to more advanced exercises or lifting weights. The ability to move and control your own bodyweight is not only important for daily life but also as a foundation for all exercise and strength training. I’ve included images and videos of each of the 5 essential bodyweight exercises along with a bodyweight workout for beginners. Take your time, master the movements and you’ll be amazed at what you can achieve without using any equipment and just your bodyweight. Have you tried these 5 bodyweight exercises for beginners? Let me know more below…. I simply wanted to thank you for making this invaluable information available without cost. I would have been happy to pay for it as it is excellent advice and instruction. I’m a “senior” (where did the years go? ), aged 62, an Australian, and been trying to lose weight really since having my children. Yoyoing back and forward, I am at my highest weight and something in my mind snapped, figuratively speaking :), and I’ve decided THIS TIME, I am definitely going to lose weight and get fit. I’ve never felt quite such determination and lack of temptation to eat the wrong things, so I thought I would further my commitment by doing exercises that will help to also give me strength. I believe kettlebells are the answer. I started doing your kettlebell exercises for seniors last night and can manage them – my heartbeat was raised afterwards but not alarmingly so but enough to know I’m gaining benefit, and it returned to normal quickly. I’ve only been on this new quest for just over a week but already my blood pressure is back to normal and I can see results – my face is slimmer and I can notice a difference around my middle. Enough gabbing on. I simply wanted to say thank you sincerely for making these videos available. If you ever offer videos or DVDs, etc, for sale, please let me know as I’d like to support you by purchasing something in appreciation. I’ll certainly let others know about your website.